C&IS’ Ad Team finished 2nd in the American Advertising Federation’s National Student Advertising Competition for District 7. This is the 24th year in a row that Alabama’s team has finished in the top four of District 7, and the 19th year out of 33 that they have finished 1st or 2nd. District 7 includes a total of 20 universities in Louisiana, Mississippi, Tennessee, Georgia and Alabama. This district founded the NSAC over 30 years ago and has a long, competitive history in the competition. East Tennessee State University and Loyola University finished first and third, respectively. The National Student Advertising Competition is the premier college advertising competition, annually providing more than 3,000 students with real world experience through the production of a strategic advertising, marketing and media campaign for a corporate sponsor. This year’s corporate sponsor was Ocean Spray. 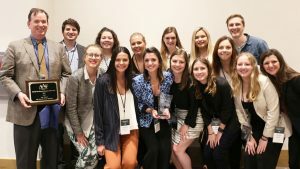 The Ad Team accomplished many of their personal goals, including improved quality of video production and creative thinking, as well as doing a better job hitting the deadlines they set for themselves. The Ad Team is not the only award winner from District 7. Waters was awarded the Donald G. Hileman Memorial Educator of the Year Award. This honor recognizes a college educator for their outstanding service to advertising students through an advertising team, a student advertising club and teaching of superior quality. Waters describes Ad Team as a department-wide effort, as it has three additional faculty advisors: Mark Barry, Randall Huffaker and Janet Walker. The Ad Team also utilizes the talents of several other faculty/staff members in the process of perfecting their campaign, including Gray Lloyd and Amy Martin, who assist with video production, and Tracy Sims, Susan Daria, Teri Henley and Joe Phelps who provided insightful feedback on their presentation.